There are now 30,000 domesticated buffalo in tuberculosis and brucellosis free areas in Australia’s Northern Territory. Feral buffalo number over 80,000. The Northern Territory Department of Primary Industry is implementing a program whereby all feral buffalo will be eradicated by 1990. The purpose of this program is to halt the spread of brucellosis and tuberculosis from infected areas. Both the Department of Primary Industry and the Buffalo Industry Council are assisting producers to build up controlled domesticated and game park herds of buffalo for production of meat and breeding animals. 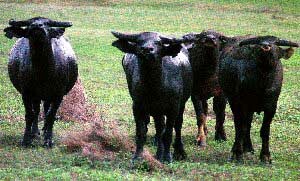 Feedlots have been established to turn out young male buffalo (approx. 180 kilograms dressing weight [400 pounds]) and work is currently underway to establish a standard carcass. Objective data are available on growth rates and fertility of the Australian buffalo. In research programs conducted in Northern Australia, growth rates appear similar to those of Brahman cross cattle. Fertility is generally excellent. A substantial buffalo meat export industry has developed with exports primarily to Europe and Asia. 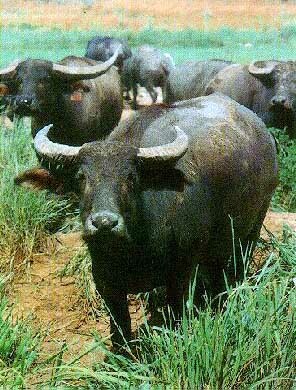 Buffalo meat is also consumed on the domestic market. Australia is basically free of major diseases affecting buffalo elsewhere in the world. We are currently searching for additional photographs and information on this breed. If you have materials which we could use or if you know of a potential source please contact us using the comment form below.